Harold John Belben, known as Jack, was born in Yeovil in the winter of 1892. He was the son of leather glove cutter Arthur Belben, originally from Milborne Port, and his Yeovil-born wife Elizabeth, known as Bessie. In the 1901 census Arthur and Elizabeth, together with 8-year old Jack, were living at 22 Market Street. In the 1911 census Jack was boarding at 49 Gordon Road, Gosport, Hampshire. By this time he was at Hartley University Training College. More of his short career is outlined below in the Western Gazette report on his death. Jack joined the Territorials while at college, the 1st/5th Battalion, Hampshire Regiment being his college company. He enlisted at Gosport, Hampshire (Service No 1261). This unit, a Territorial Force, which was part of the 2nd/1st Hampshire Brigade in 2nd Wessex Division, was formed in Southampton in August 1914 and sailed on 9 October 1914 for India. Jack went to India with his Battalion, landing at Karachi on 11 November 1914. In March 1915, Jack Belben now transferred to the 1st/4th Battalion, was sent to Mesopotamia (modern Iraq), landing at Basra on 18 March, as part of the 33rd Indian Brigade. The Battalion remained in Mesopotamia and Persia for the rest of the war. Jack was involved in various skirmishes around the River Tigris during the latter part of 1915 but towards the end of the year, by now a Corporal, he became seriously ill. He was probably hospitalised at Amara, on the left bank of the Tigris in present-day Iraq, but died of disease on 16 January 1916, he was aged 23. 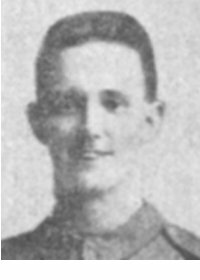 On 28 January 1916 the Western Gazette reported "Mr A Belben, of 22 Market Street, has been officially informed of the death of his eldest son, Corporal Jack Belben, on active service in Mesopotamia. Deceased, who was aged 23 years, had a promising career. He received his preliminary education at the Reckleford Council and the County Schools and then went to Gosport as an elementary school teacher, and whilst there joined the Territorials. He later went to Hartley University Training College and obtained a place out of five on the London County Council College list, receiving an appointment as an assistant master under the LCC at the Daniel Street Council School. When war broke out he was in training on Salisbury Plain with the 5th Hants (his old College Company), and went with his Regiment to India. Deceased was transferred to the Persian Gulf in August last, and had been in several of the engagements on the River Tigris. Mr Belben was notified on Thursday last, that his son was dangerously ill, and on Sunday received the notice of his death which occurred on January 16th, from a disease, the nature of which was not stated. The bereaved parents also received a message of sympathy from the King and Queen. Whilst resident in Yeovil, the late Corporal Belben, was connected with the Wesleyan cause, and his name appears on the Wesleyan Roll of Honour." 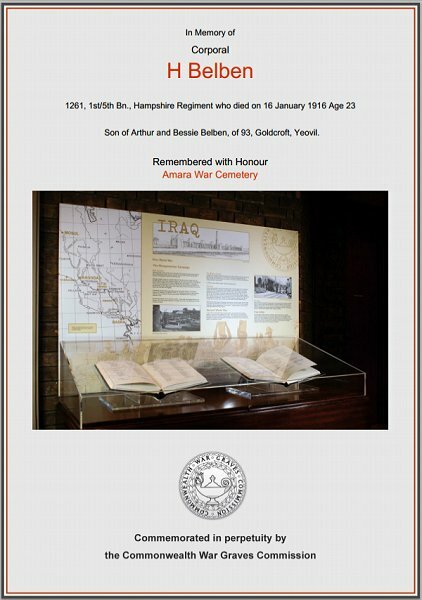 Harold John 'Jack' Belben was buried at Amara War Cemetery, Grave I.B.7., and his name is inscribed on the War Memorial in the Borough. The Commonwealth War Graves Commission certificate in memory of Jack Belben.